Most people think of chickens for the backyard, even though our web-footed friends can produce more eggs for a longer period of time, the male duck doesn’t crow, and they love to eat slugs among other yard pest. The disadvantages to raising ducks, still trying to find one. Raising any animal in a suburban setting can be challenging. First you have to see if they are even allowed and if so, do they require a permit. The next step is to put up a fence so they do not become an easy meal for the neighbor’s dog. But once these issues are taken care of, the rest is not hard. Ducks do not require nesting boxes, they do not roost, and the male duck doesn’t crow. They still quack, and some breeds are noisier than others, but are generally not that loud. Ducks are social, so you should look at having at least two. Some companies won’t send fewer that two or three when they ship them. They do live for 7+ years so keep that in mind. The laying duck needs about three square feet of floor space per duck. 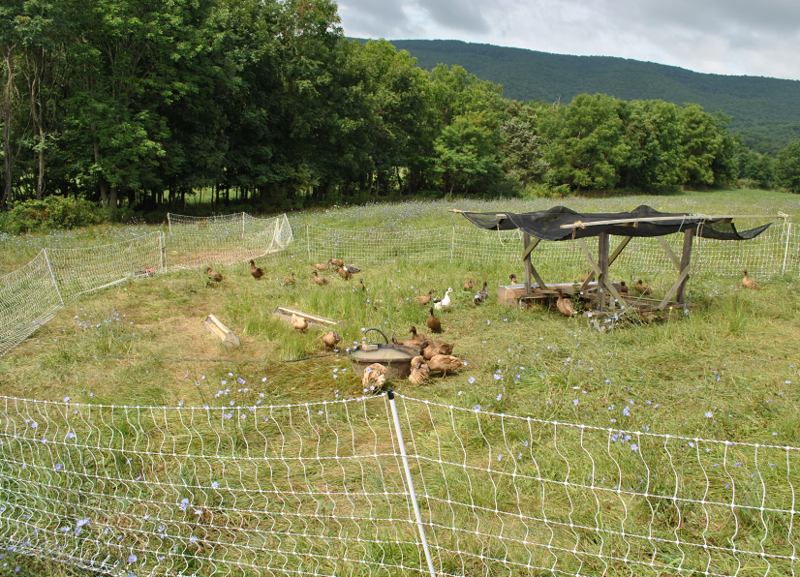 To keep the ducks corralled, it is best to put up a poultry fence that is 4’ high and depending on how many ducks, will determine the area to fence off. If you have a big enough yard, then you may want to confine how much room you fence off and move them on a regular basis. This will allow the grass to grow back and the ducks to have an area that is not barren and has a fresh supply of bugs. To figure out which breed of duck that you get will depend on what you want from the duck. If the need is just for eggs then the Khaki Campbell, Silver Appleyard or Welsh Harlequin do well. Individual females have been known to produce 360 or more eggs in a year’s time, although flock averages are nearer to 275 to 325. Good foragers include Ancona, Cayuga Runner or Magpie ducks. They are all super active and will be best for weed and bug control. Duck eggs come in a few colors; white, cream, pale green or black. Not the best for Easter egg baskets. Any breed of duck will lay delicious, rich eggs, and also provide lots of nutrient rich fertilizer in the form of manure. What about water, is a pond needed? The answer is no. The ducks would love to have a kiddie pool to play in but this is not required to remain healthy. They do need about four to six inches of fresh water to dip their heads in and clean their bills and eyes. Both the number and size of eggs will suffer if birds are frequently allowed to go thirsty. To prevent unsanitary mud holes from developing around the watering area, it’s advantageous to place all watering receptacles on wire-covered platforms or locate them on the outside of the pen where the birds must reach through fencing in order to drink. Ducks can eat the same feed as what you give chickens. To keep ducks laying the year around, they must be supplied an adequate amount of laying feed that provides a minimum of 15 to 16 percent crude protein. Do not feed ducks chicken laying rations that are medicated. To reduce waste, pellets are preferred. Fine, powdery feeds should be avoided. Feed can be left in front of the birds at all times in a trough or hopper feeder, or it can be given twice daily in quantities that the ducks will clean up in 10 to 15 minutes. The first method insures that the ducks are never deprived of feed, while the second system helps prevent feed loss to rodents and encourages the fowl to forage during the day. To produce mild-flavored eggs, feed containing marine products should not be utilized. Dr. George Arscott, formerly head of the Oregon State University Poultry Science Department, also urges that cottonseed meal not be used in breeding or laying rations since this protein supplement contains a toxin that can reduce hatchability and produce strange coloration in eggs, especially if the eggs are stored several weeks before being eaten. You might also want to keep in mind that feed stuffs such as corn and dehydrated or fresh greens cause bright-colored yolks, while wheat, oats and barley result in pale yolks. While producing, ducks are very sensitive to sudden changes in their diets. To avoid throwing you birds into a premature molt and drastically reducing egg production, it’s wise to never change feeds while ducks are laying. If the brand or type of feed you’ve been using must be altered, do so gradually, preferably over a span of at least a week or 10 days. With their well-oiled feathers and thick coating of down, ducks are resistant to cold and wet weather. For ducks in general, a windbreak that is bedded on the protected side with dry litter usually provides sufficient protection in areas where temperatures drop to zero degrees. For laying ducks, they will do better if they are housed at nighttime. The duck house can be a simple shed-like structure, approximately three feet tall, and does not require raised nest, perches and dropping pits. When ducks are housed only at night, a minimum of three to five square feet of floor space per duck is recommended. If you anticipate keeping your ducks inside continuously during severe weather, providing each bird with eight to fifteen square feet help keep bedding dry and sanitary. For consistent winter egg production, ducks, like chickens, must be exposed to a minimum of thirteen to fourteen hours of light daily. Day length is extremely important since it is the photoperiod that automatically turns the reproductive organs of poultry on and off. One 25W clear or white bulb located five to six feet above the floor should do. 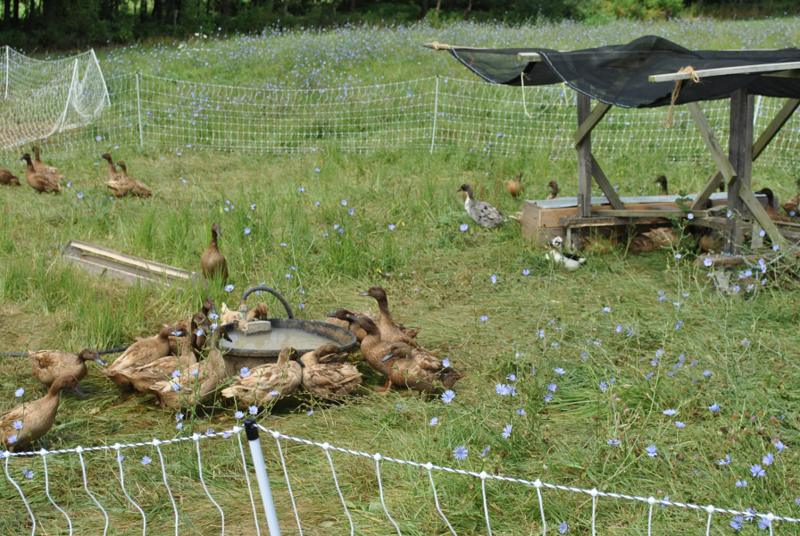 To purchase ducks, Metzer Farms sells ducklings. They are the largest source for ducklings in North America. They will ship as few as two or three ducklings almost year-round. You can even find them on Craig’s list. The nice them about baby ducks or ducklings, is they aren’t susceptible to Coccidiosis like baby chicks are, so they don’t need medicated feed. Ducklings do need a bit more niacin than chicks do. Add a sprinkle of Brewer’s yeast over their feed and also add some raw rolled oats to cut the protein levels so the ducks don’t grow too fast and have leg problems. Ducklings will need to be kept in the house, or shed, under a heat lamp for the first 6-8 weeks before they can go outside, so be sure you have a brooder set up that is safe for ducklings before they arrive home. Even if you get an older duck or rescue duck, they will often lay well for 5-6 years, often several years past your average chicken. Just remember they are social and it is best to get two and preferably three, as a starter flock. As you can see, I had trouble finding the downside to having ducks. Ducks produce eggs, keep the bugs down in the yard, are fun to watch and live for a long time with few requirements and sometimes less than most other critters on your urban farm. Holderread, Dave. 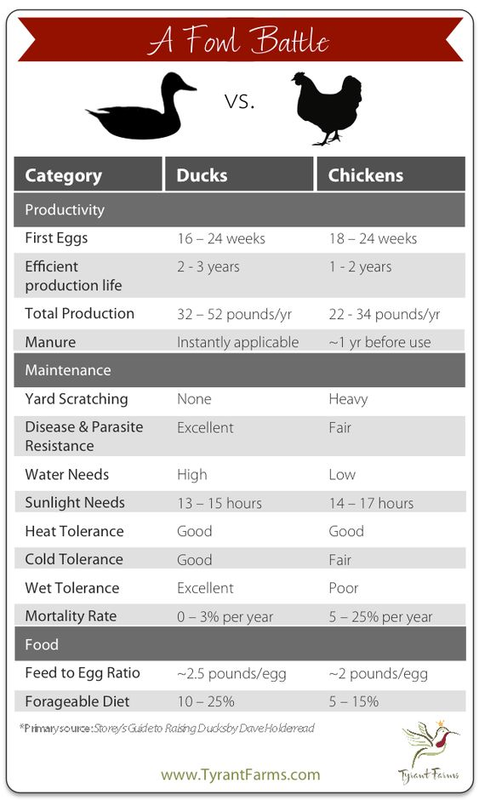 “How to Raise Ducks in Your Backyard | Backyard Poultry.” Countryside Network, Backyard Poultry, 3 Aug. 2017, countrysidenetwork.com/daily/poultry/poultry-poultry/how-to-raise-ducks-in-your-backyard/. Steele, Lisa. “A Quick Guide to Buying Ducks.” Countryside Network, 9 June 2016, countrysidenetwork.com/daily/poultry/poultry-poultry/a-quick-guide-to-buying-ducks/. Fontanes, Lori. “A Beginner’s Guide to Keeping Ducks in Suburbia.” Countryside Network, 22 June 2017, countrysidenetwork.com/daily/poultry/poultry-poultry/a_beginners_guide_keeping-ducks_in_suburbia/. Steele, Lisa. “Common Duck Diseases – Countryside Network .” Countryside Network, 5 June 2017, countrysidenetwork.com/daily/poultry/feed-health/common-duck-diseases/.